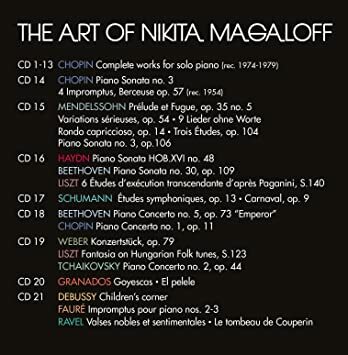 Here's an edition pianophiles will be interested in knowing about, 21 CDs of Russian pianist Nikita Magaloff (1912-1992). While I had his complete Chopin set on Philips, it is now included in Decca's set along with a huge variety of material that otherwise has not been made available for a long time, at least on compact discs. This set, of course, is of great interest to me. Here's what Wikipedia has to say about Magaloff. Brian, I think you will like what you hear. Magaloff was married to Joseph Szigeti's daughter, Irene. In fact, Magaloff and Szigeti made some recordings together. All I can say is "get 'em now before their prices go sky high!" Lance, in this and your Grumiaux post you've linked to the graphic on the amazon.com page, not to the page itself. It already has sold out on amazon, and the asking price for third party sellers from Japan is over $100. That's a bit rich for my blood, so I think I'll pass on this one. Thanks for the recommendation, though! It is considerably cheaper (right now!) at Amazon UK. I can never figure out why US Amazon and UK Amazon can be so far apart on some items. I still recommend it! All the above were recorded live in Vevey, Switzerland in 1988. Only the Three Etudes and Sonata No. 3 were recorded without the audience. My gawd, the man can play, no question about that. At age 71 then, he lost none of his technical prowess. If I had a complaint, it is about the closeness of the microphones to the piano. Given the man's enormous power, you might thing him to be a keyboard pounder - perhaps there is some of that, which is accentuated by microphone placement, but over all, the sound is very natural. Magaloff's keyboard accuracy is astonishing (listen to the Three Etudes, Op. 104 - and you will get my point.) The piano seems less overpowering in the selections without live audience. To sum it up, this is brilliant piano playing. There are some grand moments in Magaloff's playing, most worthy of hearing. 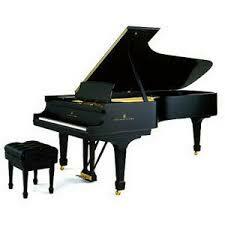 Excellent piano, incidentally, without being identified, I would guess it to be a Hamburg Steinway - full-blooded! Magaloff's set of the complete Chopin mazurkas was issued in the U.S. on the London label in the early '50s, and also a couple of single Chopin LPs, but I didn't know he had recorded all the solo music. This kind of project was uncharacteristic of English Decca; their only similar one was Backhaus's Beethoven sonata cycle, but Magaloff had nowhere near the prestige or even the name recognition of Backhaus. To me he was known mainly as an accompanist, e.g. for Joseph Szigeti, with whom he made recordings as Nikita de Magaloff. It may be, certainly, that Backhaus had the greater reputation than Magaloff, but, as I mentioned, Magaloff is a pianist with whom to be reckoned just based on what we have on recordings. He was considered fine enough to assume Dinu Lipatti's teaching position at the Geneva Conservatory after Lipatti's passing. I can better understand Martha Argerich's piano technique now inasmuch as she had Magaloff as a teacher (among several others). Maria Tipo and Ingrid Haebler also studied with Magaloff. 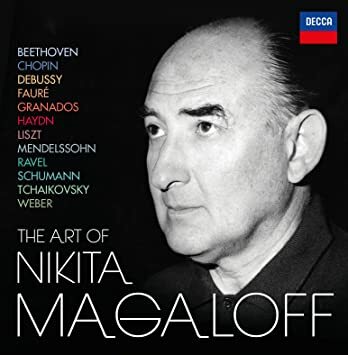 This new Decca edition will do much to bring Magaloff's name back into the piano fold. WOW ... over 500 hits on Magaloff! What's going on? With a lot of hits, has anyone beside me acquired this Magaloff set? I can only say that I'm happy to have it. I almost think this won't hang around all that long. Just revived this thread to alert everyone that amazon U.S. is now offering this set through a third party seller for $58 and change! It's now on my want list. Thanks, Lance, for the original alert. Magaloff was judged a good enough pianist to have a volume in the Philips Great Pianists of the Century collection. Thanks, Barney! Your post reminded me to check, and I found that all the Japanese suppliers have sold out, and there are only 2 boxes left from a third party seller. I just grabbed one of them for $58, which price suits me just fine. I love Chopin's music, and Magaloff's interpretations should be interesting to hear in comparison to Rubinstein & Cortot, which I'm currently going through. Am looking forward to receiving this set in the next couple of weeks. I hope you will share your conclusions. My thanks to maestro for uncovering this set here in the U.S. at such an attractive price. I only have a couple of CDs of Magaloff recorded late in his career, so I'm looking forward to exploring this wide ranging set. I will indeed, although going through the complete Chopin alone will take some time! Yes, it will take some time, but you don't have to complete the entire oeuvre to start comparing. The two selected comparisons, Rubinstein and Cortot, are obviously two of the finest Chopin interpreters of whom we have a record; the former is far and away my favourite, taken overall. Yes, I agree that Rubinstein plays all the notes with fire and discipline, yet there is something intensely moving about Cortot's interpretations, wrong notes and all. Cortot's tone is so refined I find it hard to describe: very special! I like both artists, but I'll probably return more often to Rubinstein. I also have Samson Francois, which was gifted to me by a pianist friend. Francois's rather idiosycratic First Concerto is not to my taste, but Concerto II and the solo works I find admirable, if a bit less disciplined than Rubinstein. At least he gets all the notes right! Barney, I'm finding that, after the first few Chopin discs, that Magaloff is certainly the equal of the more famous Rubinstein in technique and interpretation, and the restorations have a more open sound than Rubinstein (and of course Cortot). Cortot's Chopin is very good with not as many dropped notes as I thought I would hear, but some difficult passages can be a bit blurry: not so with Rubinstein and Magaloff, who are both crystal-clear. Cortot's 1930's recordings have been beautifully restored, it sounds like, by pressing the metal stampers into modern vinyl, and the results are fantastique, Cortot's best years, I think. All-in-all, I'm very pleased to have all three sets, along with Samson Francois, which was gifted to me some years ago. Francois is also excellent (as one would expect), except for a truly eccentric Concerto I, which I find vastly annoying. Witold Malcuzynski's box contains a great deal of first-rate Chopin as well, and I recommend it highly. These boxes appear and disappear with the speed of summer lightning, but if one can find them, they bring great rewards.